First you have to decide how you want to organize your files . You have several different ways that all can be very effective but it has to be something that works well for you intuitively. It is important for you to understand your thought processes and tendencies regarding organization. One problem I have is when something is put away and out of site I tend to forget about it. I learned this a long time ago and have since tried to organize my office paperwork and files that are most important in a way so I see them from anywhere in my office. I then order the rest of my files in the cabinet by year with sub files for monthly, sub filed then by subject. When I have rental property I use files that are sorted by address and sub filed by apartment number. It is a system that works very well but tends to use up a lot of desk top space. So if your desk is small and space is tight you will want to consider other options. Even when I used a scanner to put my files on my computer, I found it very tedious and difficult to take the time to organize them once they were scanned. 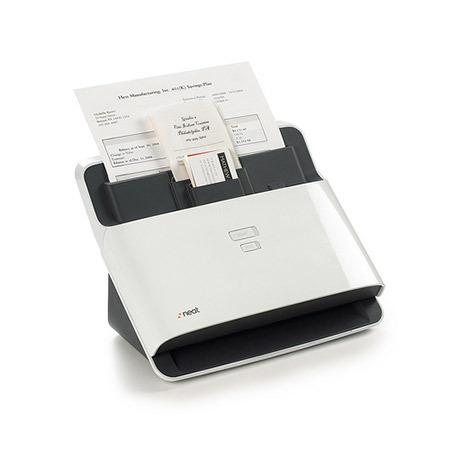 If you TryNeat and buy a NeatDesk scanner that comes with Neatworks software you can eliminate much of the drudgery of scanning receipts and documents. The NeatDesk has the ADF tray that will accept up to 50 pages at a time. This is a great feature but the best thing about the NeatWorks software is that it reads and sorts your scans automatically. You just have to put the paper in the tray and hit start. You then can search any file by keyword from information that has been extracted by the very smart software. It is a great software program. If you are bogged down in paper work or the least bit organizationally challenged theNeatDesk is a must have for your home and office. The Neat Company could have called this scanner the massage because it eliminates so much stress from you life. Especially for small business owners who have to do everything from the accounting to the sales calls and often fall behind on paperwork. The last thing a small business needs is issues that revolve around poor documentation or records for the IRS. If you TRY NEAT (Buy Here ) there is a very high possibility that you will be much more relaxed and better able to concentrate on growing your business. If you have less paper work but still feel the need for assistance you can try the NeatReceipts portable scanner that also comes withNeatWorks software . This hand fed mobile scanner can handle all of your receipts with ease and the software will do the rest. Both of these scanners can increase productivity immensely. They are intelligent and indeed very smart choices for anyone trying to increase results with less effort. It is time to TRYNEAT ! It is well worth the investment.